Tim Minchin · Matilda The Musical on Broadway: Full cast announcement and charity auction for opening night tickets! 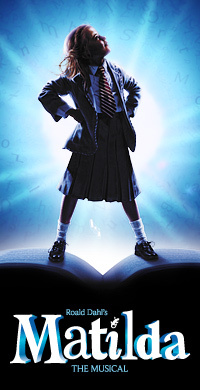 Matilda The Musical on Broadway: Full cast announcement and charity auction for opening night tickets! The Royal Shakespeare Company and The Dodgers today announced the casting of the principal roles and the ensemble for Matilda the Musical on Broadway. In alphabetical order: Karen Aldridge, best known for her starring role on the Golden Globe winning series “Boss” on Starz is to play the warm-hearted librarian Mrs Phelps, Gabriel Ebert, whose Broadway credits include Brief Encounter and Red will play the colourful and feckless Mr Wormwood, Lesli Margherita, winner of a Laurence Olivier Award for her performance in Zorro The Musical will play the flamboyant and clamorous Mrs Wormwood, and Lauren Ward, whose many London credits include Sound of Music and Philadelphia Story, will reprise her role as the kind and gentle Miss Honey. As we already announced, here, the four girls making their Broadway debut to alternate playing the eponymous heroine, Matilda, are: Oona Laurence, Milly Shapiro, Bailey Ryon and Sophia Gennua, whilst the cruel and unusual Miss Trunchbull will be played by Bertie Carvel*, also making his Broadway debut to reprise his role as the hilariously terrifying headmistress, for which he won much acclaim and the Olivier for Best Actor in a Musical. The ensemble is: Frenie Acoba, Erica Barnett, Judah Bellamy, Jack Broderick, Ava DeMary, John Arthur Greene, Emma Howard, Nadine Isenegger, Colin Israel, Thayne Jasperson, Luke Mannikus, Madilyn Morrow, Sawyer Nunes, Jared Parker, Celia Mei Rubin, John Sanders, Tamika Sonja Lawrence, Phillip Spaeth, Ryan Steele, Betsy Struxness, Samantha Sturm, Heather Tepe, Ben Thompson, Clay Thomson, TaylorTrensch, Beatrice Tulchin, and Ted Wilson*. There’s a charity auction for two tickets to the Opening Night Performance and Afterparty for Matilda on Broadway on April 11, 2013. Charity Buzz raises money for various nonprofit organisations in the US. This particular auction benefits the CFDA & Vogue’s Fashion for Sandy Relief Initiative. You can find out the details and bid here wherever you’re based but travel and accommodations are not included. *Bertie Carvel and Ted Wilson appear with permission of Actors’ Equity Association. I’m sure the show will be a big hit, and I’m delighted to see that Bertie Carvel will be Miss Trunchbull again. I’d see this show until the cows came home.